Parlez-vous français? Gluten Free in France! Bienvenidos a España Gluten Free in Spain! Akubekuhle! Gluten Free in South Africa! Sláinte! Gluten Free in Ireland! June 1st! It’s National Donut Day! Unfortunately we gluten free guys and gals can’t just run to Dunkin or Krispy Kreme to grab a treat but we CAN serve them up ourselves! It’s donut time! Beat the eggs, buttermilk, and melted butter in a large bowl with a whisk. Combine dry ingredients in a separate bowl. Fold slowly into the wet ingredients, mixing by hand with a wooden spoon. When the ingredients are mostly combined, use your hands to knead a few times to make sure the ingredients are fully incorporated. Let the dough rest for 15 minutes. Sprinkle extra flour mix on your countertop or a large cutting board. Roll out dough to between 1/3 and 1/2 inch thick. If dough is sticky, work in more flour. Heat 2-3 inches of canola oil in the bottom of a pot until very hot (375 degrees F). Cut dough with doughnut cutter OR use a glass, biscuit cutter or jar with approximately 3-inch diameter to cut disks out of the dough and use the cap of the oil bottle to cut out the center hole. Remaining dough scraps can be rolled into balls (“donut holes”) and fried. Carefully drop each doughnut in hot oil with fingers, being cautious not to splash oil. Cook until golden brown on both sides (just a few minutes). You will need to cook just a few at a time, but the cooking doesn’t take long at all so this goes quickly. Remove donuts from oil with a slotted spoon or spatula, and place on a plate lined with two layers of paper towel or brown paper to absorb oil. 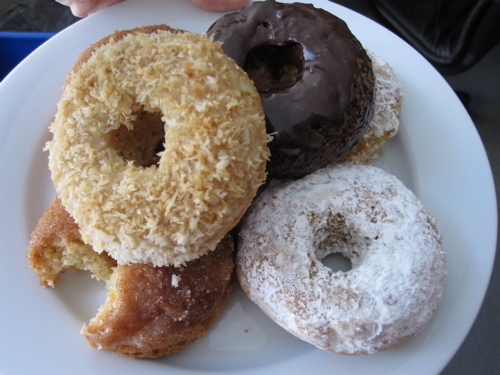 While still warm, roll each donut in the bowl of sugar to coat fully. Kwegyirba Croffie is a freelance Associate Producer at News 12 Connecticut, a Freelance Social Media Producer at NBC theGrio.com and a Intern Kitchen Writer at College Lifestyles (TM). She is a Quinnipiac University alumni and a sister of Alpha Delta Pi. She enjoy cupcakes,Broadway musicals, Forever 21 ,giraffes, peacock feathers, orchids, lillies and anything Disney. Valentine’s Day is just four days away! What are you planning for a sweet Valentine’s Day breakfast? How about some donuts? 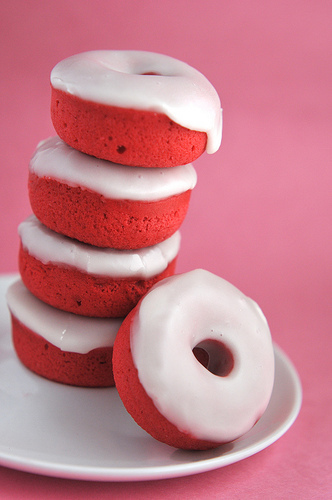 Not just ANY donuts however, Red Velvet Donuts! Yes, Red Velvet Donuts! Anything red velvet is delicious and especially sweet for Valentine’s Day! So if you are planning a breakfast in bed or breakfast for your little ones (and you have a donut pan) Red Velvet Donuts can be the perfect thing! A few notes about the recipe – the dough is pretty stiff. You will have to get in and use my hands to fill the donut pan with the dough. You also want to make sure you don’t overbake the donuts– they dry out pretty quickly! Also, the glaze is pretty thin. Double – or triple – the glaze on the donuts to get them to a nice and thick glaze like you would find in the bakery. Preheat the oven to 350ºF. Spray a donut pan with cooking spray. In a large bowl, combine the gluten free flour, baking powder, baking soda and salt. In another bowl, mix together the sugar and egg. Add the melted butter and melted chocolate to the egg/sugar mixture. Add in the vanilla and coconut milk and red food coloring. Gradually add the dry ingredients to the wet mixture, mixing just until combined. Fill the donut pan with the batter, filling each about 2/3rds full. Bake in the preheated oven for 12-15 minutes. Flip out onto a wire rack and cool completely. In small bowl, stir together all ingredients until sugar is completely dissolved. Use immediately to glaze donuts. You can either toss them in or dip just the tops. If the glaze starts to harden you can add more hot water. America may run on Dunkin Donuts, but what about we gluten-free Americans? Where are our delicious donuts? Well unfortunatley they aren’t at Dunkin but they can be in your kitchen. Give Dunkin a run for their money and make your own donuts that will have everyone running to your house! Here are are a few recipes! Note: I have made these donuts dairy free as well by substituing butternilk with a mixture of rice milk and cream of tartar. Beat the eggs, rice milk mixture, and melted buttery spread in a large bowl with a whisk. Preheat oven to 375 degrees. Spray a 6 hole donut pan with non-stick cooking spray. In a medium bowl blend together the flour, tapioca starch, cocoa, sugar, gum, baking powder, salt, cinnamon and buttermilk powder. In a small bowl beat together the eggs, oil and 2 tablespoons water. Pour the mixture into the dry ingredients and mix until well combined. If mixture is to thick add in additional water until a smooth, thick, cake batter consistency is achieved. Spoon the mixture into the prepared pan, smoothing with a spatula. Place in pre-heated oven and bake for 10 to 12 minutes. Allow to rest in pan a minute or two and then turn out onto a wire rack to cool for a few minutes. In a small bowl, blend together the coconut oil, cocoa, 1 1/2 tablespoons hot water, sugar and vanilla. Stir until smooth adding in additional water as needed. Place the cooling rack with donuts on a cookie sheet and spoon the chocolate glaze over the donuts allowing the glaze to drip down sides. 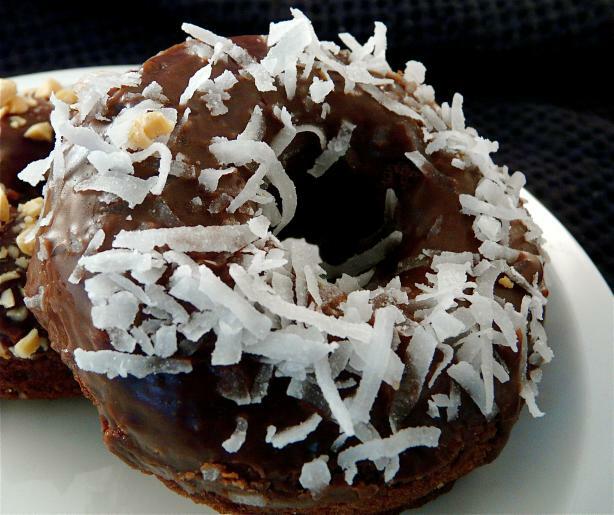 Immediately top with coconut flakes. Enjoy! King Arthur Goes Gluten Free! Enter your email address to follow TwentyOne No Gluten and receive notifications of new posts by email.